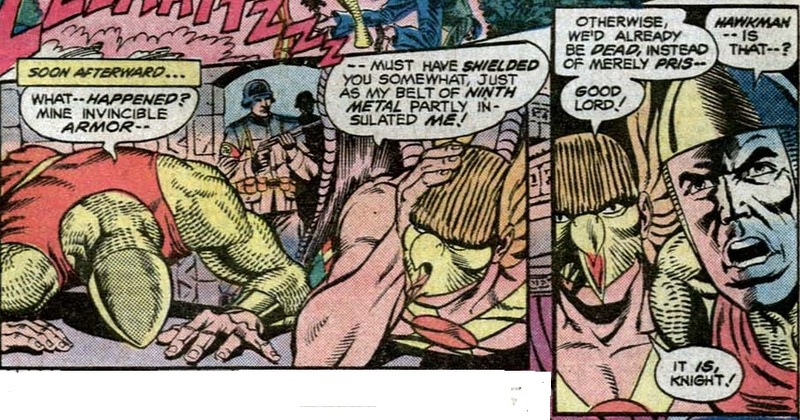 Hawkman, definitely the M.V.P. of last issue's story, has an absurd announcement. A JSAer electing to become a regular soldier is sort of like a Major Leaguer joining college baseball - illogical, and a waste of talent. And just like that everybody goes crazy. Why don't you guys use your powers and go fight in Europe and the Pacific? After all, you are not affected by Hitler and Tojo's artifacts. 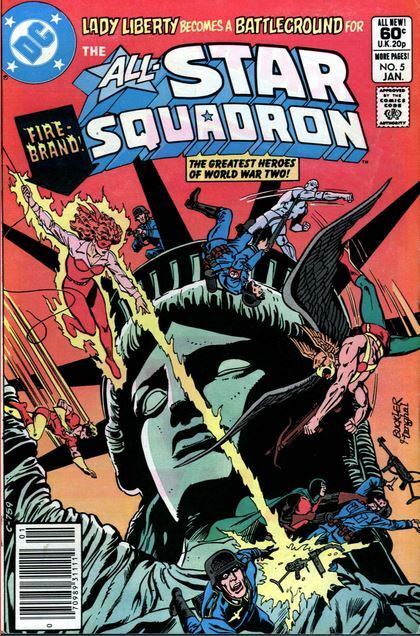 Man, if I could only give the JSA a copy of The Invaders. That's what they should do. And so the JSA disbands at a time when they are needed the most. Two of the most powerful JSAers are unaccounted for in this "join the armed forces" farce. 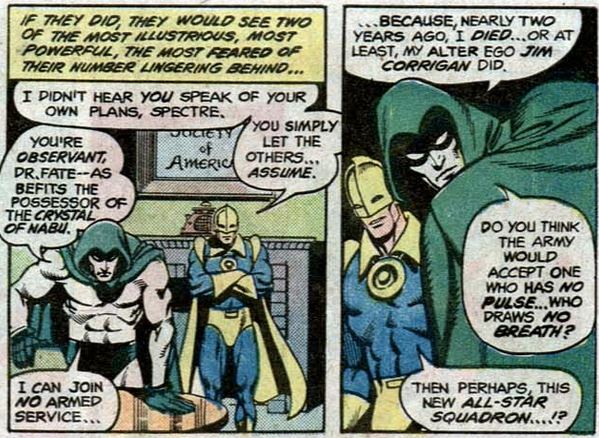 The Spectre voices his decision. As for Kent Nelson, looks like he's not signing up. Three JSAers decide to have one last adventure before enlisting. 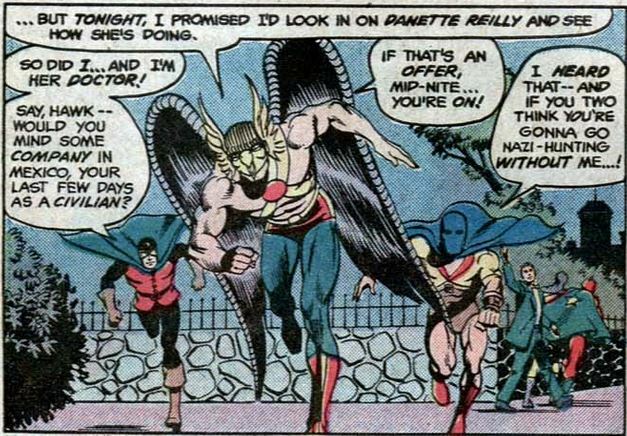 I'm talking about going down to Mexico to find Shiera Hall, Hawkgirl; not the visit to Danette Reilly. In Mexico the Nazis and some modern day Mayans have formed an alliance. In the United States war is going to be formally declared. In another reference to DC's Golden Age, Green Lantern is shown to have foiled a German attack on America's East Coast. In Mexico an alliance between the Nazis and a modern-day Mayans is forged. 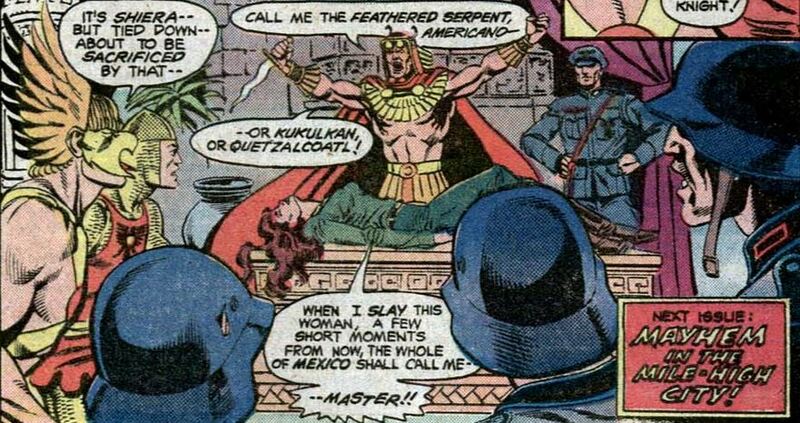 Hawkgirl has been captured by this would-be dictator. 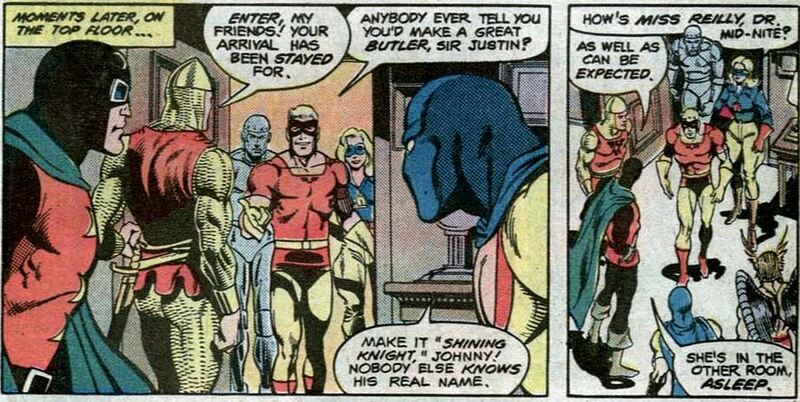 In New York, Robotman and Johnny Quick are two people that don't need a cab. While they are running, they are spotted by Sean Connery and Robert Mitchum. 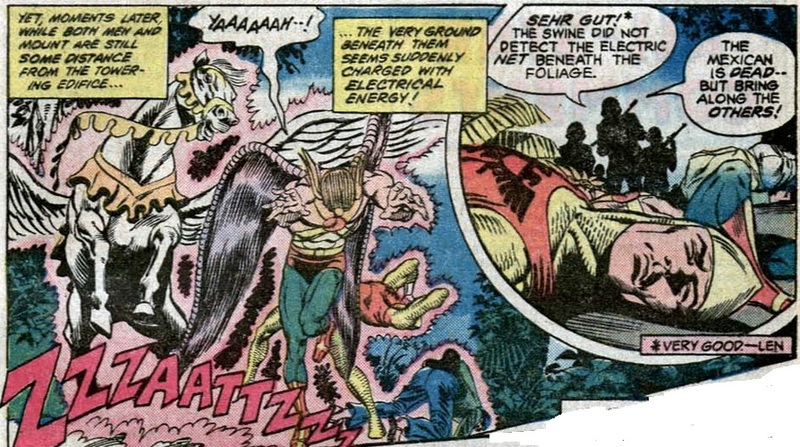 Both Quick and Robotman are alerted to a problem in the vicinity of the Statue of Liberty. Some Nazi sympathizers, known as Bundists, are holding people hostage. Johnny runs up there and deals with it. In spite of Quick's best efforts a grenade goes off and threatens the structural integrity of Lady Liberty. It is up to Robotman to bolster the Statue. 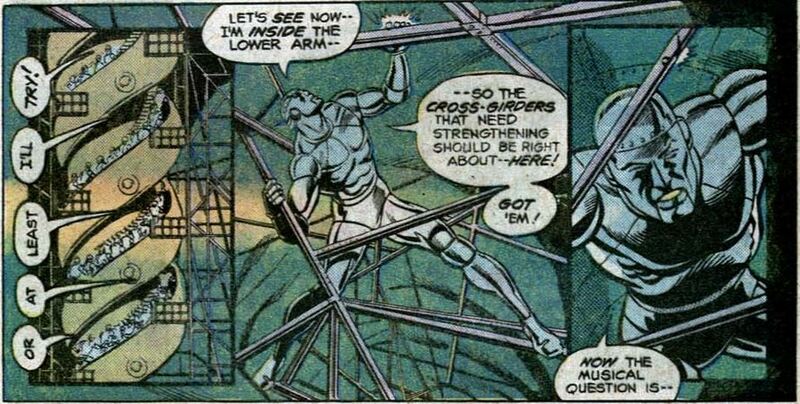 While Robotman hold things up, Johnny Quick does some repairs. 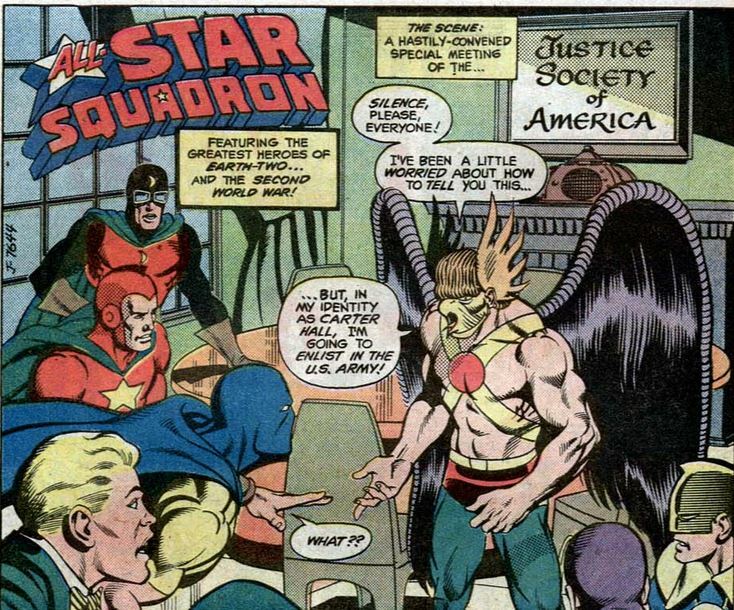 Seeing the non-JSA members of the All-Star Squadron I've become aware that they simply don't have the sheer power of the JSAers but Johnny Quick and Robotman are fast becoming my favorites - these guys might not be Spectre-class (who is?) but they're quite formidable; and Robotman is right: they make a good team. Strength and speed. 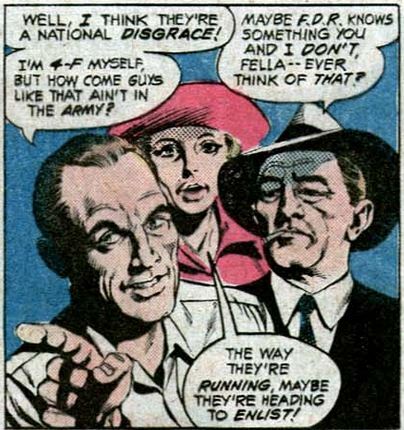 With the Statue of Liberty caper resolved, both heroes head over to check Danette Reilly only to find everybody else there before them. 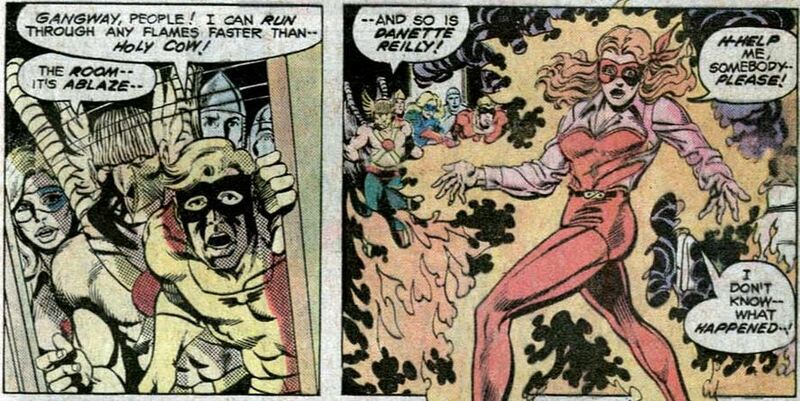 If you recall, Danette was hit by a bolt from Wotan and fell into a lava pit. Somehow she survived but has become feverish since then. The heroes see smoke and just like that Firebrand is born. Or I should say Firebrand II. Johnny Quick puts out the fire. 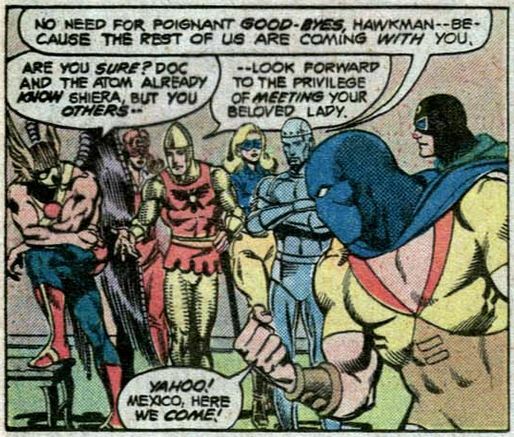 With everything resolved, Hawkman, Atom and Dr. Mid-Nite are about to embark for Mexico as planned, but the rest of the team insists on tagging along. Arriving in Mexico, the team finds out the Shiera Sanders is missing. They also promptly walk into a Nazi ambush. Firebrand gets an opportunity to showcase her powers. 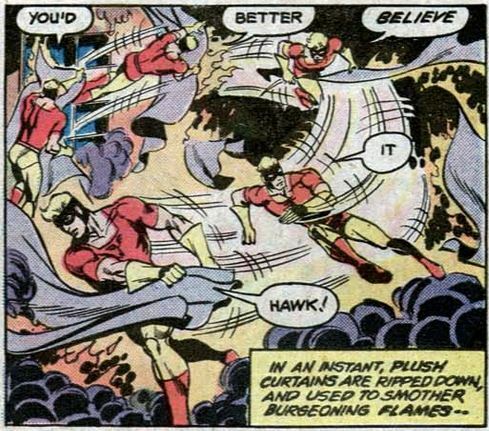 Hawkman and the Shining Knight, being fliers, are not part of the group who got ambushed. 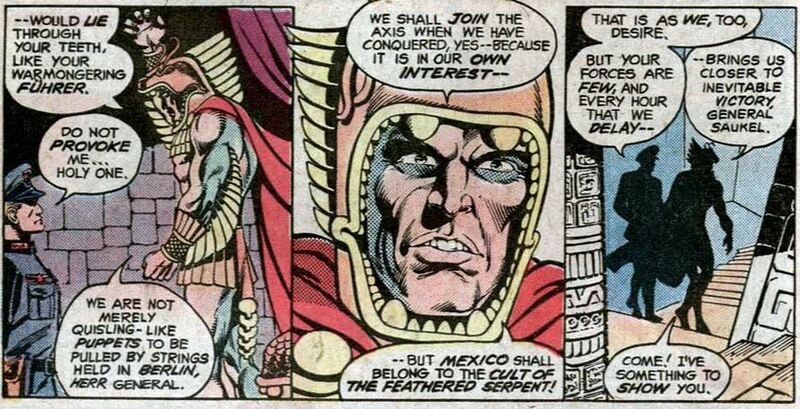 They are being led by an unwilling Mexican guide to the location of Hawkgirl. But they too walk into a trap. Although their poor guide does not survive both Hawkman and the Shining Knight owe their lives to their equipment. They have come just in time to see a revival of the ancient Mayan ritual of human sacrifice.